HP announced a boatload of new premium Envy laptops both in convertible and standard clamshell flavors. Out of both series, though, the HP Envy 13 and Envy 17 have seen the most refinement. Featuring smaller and thinner chassis, these notebooks prove you don’t have to live the dongle life as they integrate an ingenious drop down USB-A port on top of featuring USB-C.
HP also managed to reduce the size of the top bezel by 31%, while still reserving enough space for a webcam above the screen. Around the back of the laptop, you also might spot a tiny strip of Damascus steel patterning that’s been laser-etched to this notebooks shell. It’s a neat touch, but one that's too easy to miss. Whether you go for the 13-inch or 17-inch model, both laptops can be equipped with 8th generation Intel Core processors, Nvidia GeForce MX150 graphics and either Full HD (1,920 x 1,080) or 4K (3,840 x 2,160) display panels. The Envy 13 and 17 will start at $999 (about £735, AU$1,320) and $1,049 (about £770, AU$1,390), respectively and will be launching later this month. 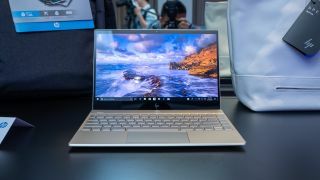 The HP x360 13 and 17 have seen a less dramatic redesign though users can now choose between Intel or AMD Ryzen CPUs as well as Nvidia GeForce MX 150 or Radeon Vega graphics. HP has also brought its Sure View integrated privacy screen technology, first seen in its enterprise laptops, to the Envy convertible series. It’s a useful feature that you can flip on with the press of a single keyboard shortcut, but during our time with the laptops, the feature delivers an unintended side effect: partially obscuring the screen even when we're just looking at it dead on. The HP Envy x360 13 and 15 will also be available later this month with AMD configurations starting at $759 (about £560, AU$1,010) and $749 (about £550, AU$990), respectively. The Intel-based HP Envy x360 15 will cost a little more at $869 (about £640, AU$1,150). HP has announced a ton of notebooks, but are they worthy to become the best laptops?